Happy Patch Tuesday, Microsoft device owners. And a very happy one to owners of the Surface 2. Microsoft is out with a half-dozen updates to improve the second-gen Surface running Windows 8.1 RT. The updates include performance enhancements to all Touch and Type Cover variants, updates to Wi-Fi and Bluetooth drivers and boosts in battery life. Surface Pro 2 owners, which we're sorry to say didn't seem to receive any updates today, saw a firmware patch deliver considerably better battery life earlier this month. While there are no figures on just how much the Surface 2's battery is improved, it's a welcome mark in the juicer column. Surface 2 owners are also receiving camera and audio improvements, including the tablet switching to speaker playback after disconnecting a headset. Revolutionary, we know. Finally, system performance and stability improvements round out the slate's November 2013 updates. 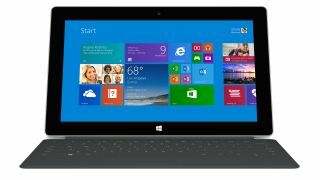 The Surface RT and first Surface Pro nabbed a few improvements too, as well as Surface Pros that have been updated to Windows 8.1. There's more afoot at Microsoft than tablet system updates, and new evidence points to active testing of the Windows Phone 8.1 update. As spotted by Nawzil, a social network specialist at Microsoft Kuwait, by way of WPCentral, FB Pages Manager was spotted on Windows Phone 8.1. A screen grab shows multiple versions of the updated mobile operating system. WP8.1 is expected early next year, likely launched with new hardware. With Nokia rumored to be developing several new products, it seems likely the company's latest gadgets would launch with the latest mobile OS (that's Windows-based, of course). CES 2014 is right around the corner. Get caught up on all the latest for the show!